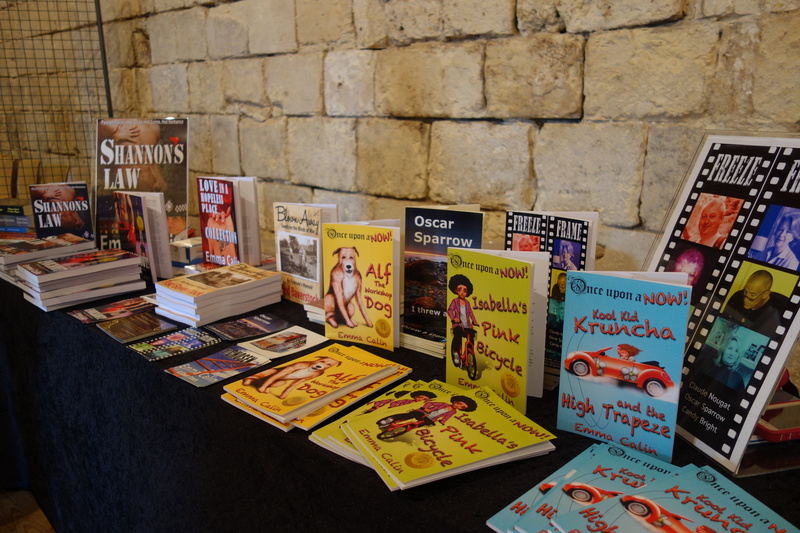 Gallo-Romano Media was one of 18 publishers exhibiting at the recent ‘Salon des Editeurs’ in the beautiful town of Saint Savinien sur Charente, in south west France. Our colourful display of titles attracted a great deal of attention from local french readers who braved the freezing weather on ‘Mother’s Day’. Many were bemused as to why a British company was on show in deepest rural France. They had not realised their little town was a hotbed of activity for book production on an international scale! In France book pricing is strictly regulated. Hardback and paperback editions are very expensive and the laws on discounting books put digital versions on sale at more or less the same price as print. There is much scepticism about e-readers and digital books in general. BUT – we still have book shops in France. There was a lively public ‘debat’ (discussion) in the afternoon – after a most convivial three-course picnic lunch kindly provided by the Mayor! The consensus was that most local folk could not see themselves reading to their grandchildren from a screen. I showed them ‘Alf the Workshop Dog’ on my Kindle Fire – with illustrations and links to video clips and downloadable colouring pictures. All very nice, but they don’t believe it will catch on. I worry that French culture will lose out in the long run if it is not accessible to the world. Watch out France – your younger generation is already downloading. Older folk may not buy-in to e-readers, but the youth of today are using their smart phones, tablets and online devices to satisfy their entertainment needs. Reading a story is just one small element alongside films, video clips, on-demand TV, gaming and social media that vie for our time. If you’ve got a link to the internet you can read stories from all over the world, regardless of national boundaries. If there is not enough material at reasonable prices in French, there’s nothing to stop readers trying out the millions of books available in English, German etc. It would be shame if their efforts to protect existing publishing structures resulted in limited world access to their wonderful philosophy, poetry and written arts, from which we can all learn so much.